Marvel Universe LIVE has slowly been announcing which characters will be appearing when the show hits the road. I for one plan on taking my nephew to see this if it comes to the area. 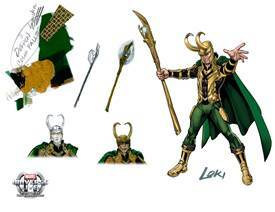 Now it’s been announced that the and only Loki will be joining the group. Is there anyway we can get Tom to come back and take over the role? Maybe? Please? Loki is currently burning up the screen in “Thor: The Dark World” and it may be awhile until the breakout character returns to cinemas, but that isn’t the only time fans will get a taste of his unique brand of villainy. Today, Feld Entertainment and Marvel Entertainment announced that Loki’s wily skills will be on stage at Marvel Universe LIVE! alongside other top Marvel villains such as Red Skull, Dr. Aldrich Killian, AIM and the Chitauri Warriors. Marvel Universe LIVE! will bring Marvel’s most iconic heroes and fearsome villains to life like never before during a live-action arena spectacular that will tour 85 North American cities in its first two years. In association with Feld Entertainment, it will redefine the live show experience by integrating a Marvel character driven story with state-of-the-art special effects, pyrotechnics, aerial stunts, martial arts and countless other show elements. And here’s a look at the costume design! This entry was posted in Marvel, Toys/Collectibles and tagged Collectibles, marvel, toys. Bookmark the permalink. Meet The New Ms. Marvel! San Diego Comic-Con Preregistration Will Not Occur In November!